Plan to make All Fired Up part of your next Field Trip. 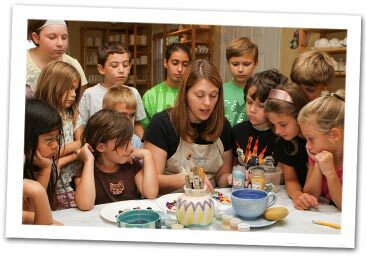 We accommodate grades K-12 and offer a variety of painting, glazing and wet clay classes at our studio or at your location. Students can create a clay pot, a fish, a self-portrait, or a plaque. Selection of pieces to glaze includes tiles, 12oz mug, salad plate or bud vase. For field trips, the minimum group size is 10 and the maximum is 50 at our studio. We can also come to your location to offer a field trip program for groups of 10 or more with the addition of a $50 travel fee. All pieces will be coated with a clear glaze and good for everyday use. Pieces will be ready for pickup one week following the trip. Please contact us if you have additional questions.